Thinking about writing your small business or entrepreneur bio? Great idea, because it’s an important document that shapes first impressions of you and your company. A strong entrepreneur biography written in the correct style and format will positively reflect who you are and what you have accomplished in your career. Here are 9 important points to consider when writing your entrepreneur bio. The first step when writing an entrepreneur bio requires a bit of analysis. You need to ask yourself what you want your bio to accomplish. Is it to get investors? If so, you’ll want to emphasize your financial track record and and profit potential. On the other hand, if the purpose of your bio is to introduce you as a keynote speaker at an industry conference, you may choose to put more emphasis on your status as an expert in your field. 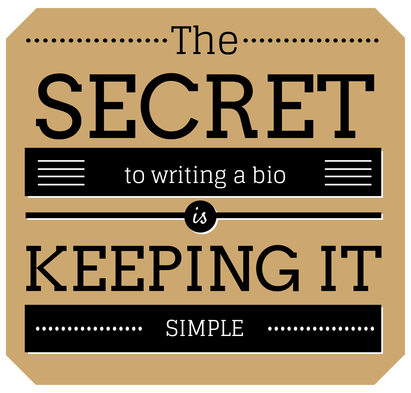 After you’ve determined the purpose of your professional bio, you can start to write. The first sentence of your bio should state WHO you are and WHAT you do. Here’s an example: _________ (your name) has been an entrepreneur and a __________ (another role, normally describing your professional expertise, e.g. plastics consultant) since ____ (year). Or you could start with something like this: _________ (your name) started __________ (company name) in ______ (year). Notice both these opening sentences quickly and concisely give your basic information and let the reader know WHO and WHAT the bio is about. For best results, waste no time establishing your credibility. Quite often, people will only read the first one or two sentences so you want to make a strong impression right away. He/She has over ___ (number) years of experience in ________, _________, and ________ (the fields or disciplines that you have worked in). It’s easy to fill up a personal bio with so many facts and numbers that you leave your readers glassy-eyed. Your bio should not be a boring list of certifications and former positions. It should state in simple language what you have to offer potential investors, clients or audiences. The most effective professional bios use clear, simple language. Think about really excellent print advertisements: the best ones get their message across with simple but punchy language. It is possible to describe your background without requiring your readers to get out a dictionary! The first draft of your entrepreneur biography will likely be quite long. That’s OK. It’s better to get all your ideas down and then edit out the unnecessary parts, than to sit in front of a blank screen paralyzed by trying to get it perfect right off the bat. After you’ve listed everything you have done and what you have to offer, it’s time for the red pen. Trim the fat – all of it. Of each piece of information ask, “Do they really need to know this?” Readers, especially online readers, get distracted quickly. I can’t emphasize enough the importance of keeping your bio short and concise. What should be cut during the edit? What you decide to include may be different depending upon which audience your bio is intended for, but the bottom line is: Leave out anything that does not present you at your best. Remember, a bio is not a resume. You are under no obligation to include your entire work history. That’s what resumes are for. In contrast, a bio is a document meant to present you in the most advantageous way. For example, if you are an on-the-job learner who bypassed college, leave out a discussion of education. Anyone who really wants to know can contact you. Likewise, did you win an award that is recognized within your industry but not heard of outside of it? Leave it out unless your intended audience is industry-specific. Under ______’s (your name) leadership, __________ (company or division name) grew from/achieved/improved (choose one of the foregoing) ___________ (quantifiable business result you achieved). If you are writing an online bio, include links to your company’s website, relevant publications you have authored, and any social media profile you have set up for business purposes. If you do this, remember to keep those links and profiles updated. If you put the same energy and creativity into writing your bio as you do into developing your business ideas, you will certainly come up with an effective professional bio. One final tip: Ask the best writer you know to edit your bio, or consider using a professionally written entrepreneur bio template to save time and hassle. Good luck!